Hand Over The Coffee [H6405] - $9.98 : Yarn Tree, Your wholesale source for cross stitch supplies. A cross stitch pattern by Barbara Anna. "Hand over the coffee... and no one gets hurt!" Ever feel that way in the morning? 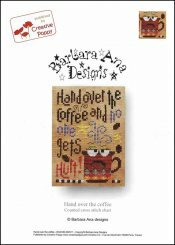 Express it in cross stitch with this fun coffee mug pattern with a good dose of humor from Barbara Ana. Stitch count 49 wide x 70 high. Stitched on 28ct Linen.